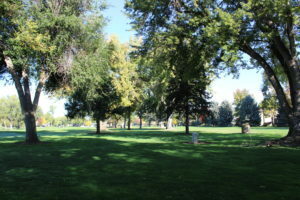 Steve Price, Matt Wilde, Kimbell Gourley and Craig Quintana sat down with Garden City Mayor John Evans, City Attorney Charles Wadams and Development Services Director Jenah Thornborrow on Friday to discuss the proposed Open Space Ordinance. The outcome was a better-defined process to get the ordinance and a related zoning map amendment before city advisory boards and the City Council in coming months. P reviously, the ordinance advocates and city staff disagreed over what was needed to take the ordinance forward, which is what stalled consideration in November. The proposal would create a new, open space designation for the city's land use code, which could afford more protections for any potential development of a green space like Plantation (restrictions on the type and intensity of development). The group will amend the application for the ordinance, allowing for a now-required neighborhood meeting before the proposal gets formal consideration by the Design Review Committee, the Planning & Zoning Commission and the City Council. This also will involve wider public notice than the hearing postings that occurred in October, which the ordinance advocates will have to accomplish to meet city requirements. Having a law guiding the protection of open space -- including what kinds of low-intensity development can occur, and what is a no-go -- is one thing, but a vital second step is applying that law to a specific piece of property. The city sought more details on this point, and the ordinance advocates agreed to bring a second proposal for a zoning map amendment, which could change the zoning of Plantation from R-2 to the proposed OS (Open Space) designation. City officials and advocates agreed the goal should be to consider the two proposals in side-by-side fashion, the ordinance coming up for consideration just before the zoning amendment. The consolidated hearings will make things easier on everyone. About that: We're weeks away from having firm hearing dates but please stay tuned. You will know when it's time to write letters and emails, and to attend public meetings. Lastly, your efforts are being felt at City Hall and elsewhere. Ms. Thornborrow's file on the ordinance is a couple of inches thicker with all of the letters and emails of support, and Mayor Evans noted he sees a "Keep Garden City Green" sign every day. Thanks for your continued support, which is obviously going to be needed well into 2019. What ever happened on this? John — See the latest blog post; the updated ordinance package will be filed in coming weeks.